There are many in museum studies which have been inspirational, but if we had to name three that have been important for this project exploring curatorial practice, we would say Beryl Graham and Sarah Cook’s Rethinking Curating (2010), which is a refreshing take on what curators have been doing with new media art; James Clifford’s Returns: Becoming Indigenous in the 21st Century (2013), which is a wonderfully thoughtful and measured analysis of the re-emergence of native and tribal identity in recent times; and Simon Knell’s Museums and the future of collections (2004), a classic study of museum practice and how it changes over time, and a catchy and pertinent title that we borrowed for this book – thanks Simon! Yes, the book was drawn from two conferences, one in Aotearoa New Zealand and one in Germany, which threw up lots of ideas that we had not considered, as well as countless conversations with curators from around the world in a range of different kinds of museums. The final book is a much more wide ranging study than we envisaged when we began, thanks to all the input, debate and collaboration involved – in fact, you could say the book was co-curated, which is entirely appropriate given our subject. Collaborating with the many colleagues in museums and universities who wrote chapters from different perspectives on curators and curating – we feel that this network of people have created a framework for what we call curatopia, a new vision for curating in the 21st century. Hard is probably the wrong word, but it is challenging and ultimately rewarding to draw and keep together a very diverse range of perspectives to develop and maintain a coherent intellectual project over a long time. Conal’s recent books include Museum Practice (2015), From Colonial Gothic to Māori Renaissance: Essays in memory of Jonathan Mane-Wheoki (2017) and Te Papa: Reinventing New Zealand’s National Museum 1998–2018 (2018). Philipp is co-editor of the volume Transpacific Americas: Encounters and Engagements between the Americas and the South Pacific (2016), and currently finalises a partially co-written monograph Refocussing Ethnographic Museums through Oceanic Lenses (University of Hawai’i Press). We have both published a diverse array of titles, but for Conal seeing his MA thesis on colonial architecture turned into a book launched in his home town of Oamaru in Aoteoroa New Zealand was pretty special. As Philipp points out in the Coda of Chapter 18, Curatopia has been the highlight of his career so far so seeing it in print will be very special. MUP has a great list in many topic areas relevant to galleries, museums, heritage, anthropology etc. Conal published before as individual author in MUP books and thought they did a great job of production and design, and have extensive networks that can get books out to readers in different sectors, not just Universities. As pointed out above, this book is not a collection of individual chapters for a single occasion, but the outcome of a network of people devoted to rethinking and redoing curatorship over a number of years. We hope that readers will get a sense of this. We are both working on a number of projects at the intersection between indigeneities, museum institutions, and the history of anthropology. In one of them, we are both engaged in a collaborative project on ‘the museum as archive’. 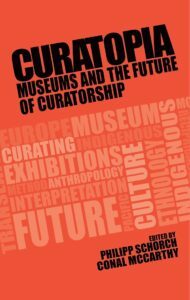 Curatopia: Museums and the future of curatorship is available to buy now. You can recommend to a librarian or request a review copy. Category: Anthropology, Archaeology, Art History, Author Q&A, Blog, Cultural Studies, History, Social History, Sociology	0 Comments.